Spring has finally arrived here. The leaves on the trees are budding, my crocuses and daffodils have made an appearance, and I have even heard the sounds of lawn mowers in the neighborhood. I have also noticed the bright yellow heads of dandelions amongst the emerald green grass as well. For many, the dandelion is a weed, a nuisance plant that is out of place in a well-manicured lawn. As a child, I loved them. They were a flower I was allowed, even encouraged, to pick. I can remember creating bouquets of them with some Queen Anne's Lace and proudly presenting them to my mother, who dutifully sniffed them and proclaimed it to be beautiful without even wrinkling her nose. (A true effort of will if you have ever smelled Queen Anne's Lace!) As we grow older, though, that bright yellow flower loses its allure and becomes an undesirable. I don't know about you, but I have felt like that at times. I poke my head up, a little different than the things around me, and let my colors shine...only to be left feeling undesirable or out of place by those around me. I felt that way when I returned to college, the old-timer in my 30's amongst a crowd of teens. I felt that way when I went against the norm and decided not only to homeschool my youngest child, but to keep my middle school child home as well. And I have felt out of place in certain crowds simply because of my faith in Jesus. I'm sure you have too. Do you know what though? That's okay. He knew that we were going to feel out of place once we decided to follow Him, but He also knows that is necessary in order to bring God's truth to the world. If we looked and acted like everyone else, how could we point the way to Jesus? 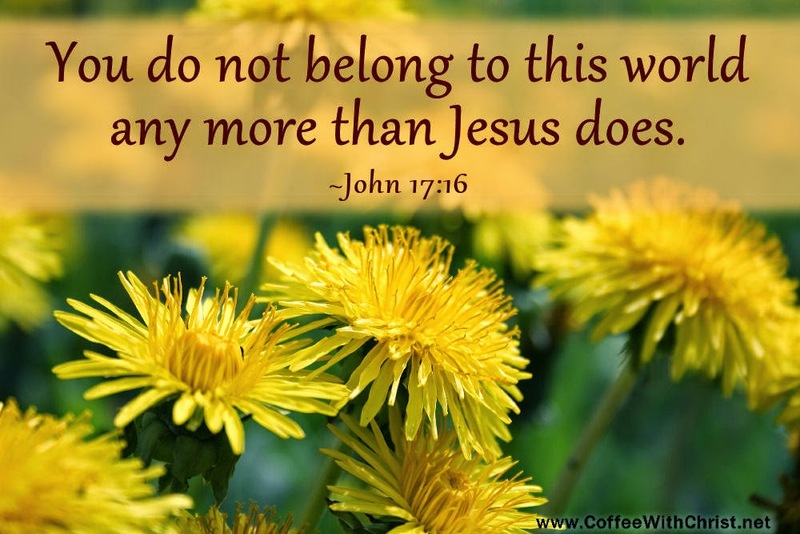 So the next time you see a dandelion, remember that God calls you to be in the world, a part of that field, but not really of the field. Rather you have been sent to the field. You have a mission to stand out and be different, it's a good thing. Take comfort in the knowledge that Jesus has already prayed for your protection on this mission to stand apart. Next Tuesday I'll share another little lesson I picked up from that little yellow weed.